Welcome to China. Upon arrival in Beijing, you will be met & transferred to check in your hotel. Free leisure for the rest of the day. Full day trip to the Tian'anmen Square, the Forbidden City, and the Temple of Heaven. Enjoy Kungfu Show in the evening- The Tian'anmen Square : The largest city square in the world. The Forbidden City : The largest imperial palace in China during the Ming and Qing dynasties with a history of around 600 years. The Temple of Heaven : The place where the ancient emperors used to pray for the God's bless of the whole nation. Full day trip to the Great Wall,Ming Tomb and Sacred road. Enjoy a famous Peking Duck Banquet for dinner. The Great Wall : One of the seven wonders in the world and the symbol of China. - The Ming Tomb : The only underground tomb of the thirteen tombs of the emperors in the Ming Dynasty. Visit The Summer Palace, Cruise in the Summer Palace, Hutong. You will be transferred to the airport in time for your flight and fly to Xian. The Summer Palace : The largest and best-preserved royal garden in China with a history of over 800 years. Hutongs: was near the palace to the east and west and arranged in orderly fashion along the streets. Most of the residents of these hutongs were imperial kinsmen and aristocrats. Another kind, the simple and crude hutong, was mostly located far to the north and south of the palace. The residents were merchants and other ordinary people. Full-day visit to the Terra Cotta Warriors and Horses (include golf carts), the Big Wild Goose Pagoda. In the evening, enjoy a Chinese dumplings feast and the Tang Dynasty Song & Dance Show at Tang Yuegong Theatre. Pay a morning visit to Ancient City Wall where you can enjoy a walk or biking on the top to have a bird view the ancient capital city. Then take an afternoon bullet to Lanzhou. After breakfast, you will take a morning drive head to Xiahe visit the Labrang Monastery, Songke Grassland. Labrang Monastery: at the foot of the Phoenix Mountain northwest of Xiahe County in Gannan Tibetan Nationality Autonomous Prefecture, Gansu Province. A propitious place in the hearts of the Tibetan, it stands by the Daxia River and faces the Dragon Mountain.As for the Dragon and Phoenix Mountains, there is a beautiful legend. A long time ago, this place was a boundless sea. After countless changes, mountains and lands appeared. After breakfast, you will be transferred (4 hours drive) back to Lanzhou to for afternoon visit to Gansu Provincial Museum or White Pagoda Hill. Then you will be transferred to the railway station for evening bullet train (3 hours) to Zhangye. 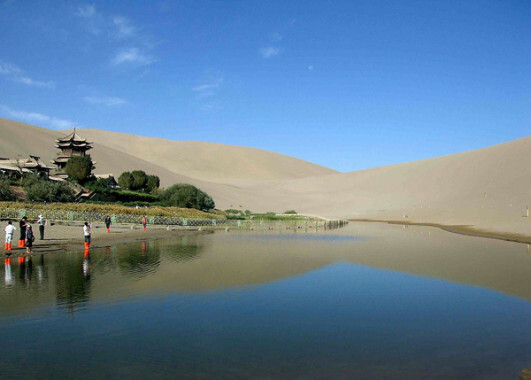 Morning head to visit The Jiayuguan Pass, The Great Wall on the Cliff, Great Walls Museum and Yulin Grattoes.Then head to Dunhuang. Great Walls Museum: The Great Wall museum opened to visitor in October 1989 and it is the first one to exhibit the Great Wall culture in a comprehensive and systematic way.The Museum covers an area of 12,312 square meters with an exhibition area of about 1,766 square meters. Its main building takes a shape of a typical signal fire tower on the Great Wall. Apak Hoja Tomb: This Mazar is the holiest place in Xinjiang and an architectural treasure Built in 1640 ,it is reminiscent of the Central Asian artistic style of Samarkand or Isfahan. A handsome blue-and-white tiled gate leads into the compound, which includes a small religious school and the Abakh Khoja family tomb. The latter is domed and faced with muti - colored tiles. I t most complete Islamic tomb of the Qing Dynasty up-to-now in China. Kashgar Old town is an ancient city, and in walking the streets of its Old Town, will provide a sense of what this legendary Central Asian hub was like in the days when the Silk Road was at its zenith. 500-year old remnants of the city wall, narrow lanes and colorful muti-ethnic crowds combine to make Kashgar' historic district a highlight of any visit to the city. Tashkent, the capital of Uzbekistan, the biggest city in Central Asia. It is known all over the world as a city of friendship and harmony. It has a unique mix of ancient history and modern life! The first half of the day you will visit Khastimam Complex, Kukeldash Madrasah, and Chorsu bazar. After lunch you will see the New Part of the city; Independence square, Museum of Applied Arts of Uzbekistan, Alisher Navoi theatre, and Amir Temur square. Night is in a hotel. Samarkand is the grandiose capital of the Empire of famous Tamerlane - Amir Temur. It has has the biggest mausoleums, madrasahs and mosques in Central Asia. Full day will be dedicated to sightseeing in Samarkand. Today you will visit Guri Emir, legendary mausoleum of Amir Temur and all his family members, Registan square, world famous complex of 3 Madrasahs and Golden mosque, Mosque Bibi Khanum, Traditional Siyab bazzar, Shahi - Zinda necropolis, a holy place and cemetery with mausoleums of Temurid dynasty and a grave of cousin of Prophet Muhamed, and finally observatory of Ulugbek. After excursion you will have free time. Night is in a hotel. After breakfast, you will have a morning relax until a transfer for the flight to your next destination.